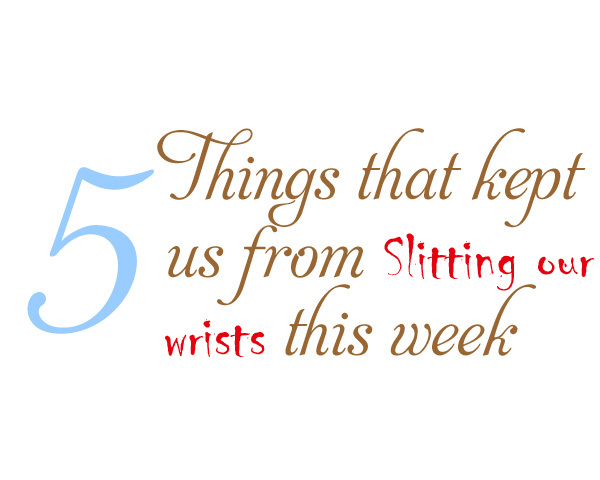 It wasn’t easy but we did manage to come up with five things this week. Here they are. 1. Wikipedia. We know that Wikipedia should not really be used as an official reference, but as an unofficial one it can’t be beat. There is an article on just about every single thing under the sun. Everything from Veruca Salt to Ancient Greek characters and that’s what prompts our love for this week. One of the Sisters was reading The Lightning Thief by Rick Riordan. For those of you unfamiliar, the series of books are very Harry Potter-esque except that they revolve around the ancient Greek myths. This is a topic that has always fascinated this Sister and, as she was reading, she frequently looked up the more obscure characters to find out more. For instance, Thalia. This was the first line of the Wikipedia entry: Thalia or Thaleia (both pronounced /θəˈlaɪ.ə/) is spelled Θάλεια in Greek and derives from the same stem as θάλλειν “to bloom”. Are you able to use the pronunciation guide? This sister laughed and laughed. In this particular instance, we think Wikipedia blew it. 2. Handsome, dumb husbands. The Sisters have been very fortunate when it came to looks in the husband department. All three of the men fortunate enough to be espoused to the Sisters are quite handsome – and usually intelligent. It was the intelligent thing that got them married to us in the first place. But sometimes being pretty helps. We’d love to give you a specific incident where being pretty was a viable survival skill in their arsenal, but we can’t. All you ladies out there know exactly what we mean. 3. 300 in Spanish. The movie 300 is, well, hold on. This Sister is going to need a moment alone just thinking about this movie. We will watch this movie every single time it’s on TV. In fact, one spectacular summer when it was on HBO 7,000 times a week, one of the handsome husbands walked in on a Sister watching it – again – and he yelled, “Oh my God! I’m going to get a complex!” With the one noted exception of the hunchback, every single character in that film is drool worthy – even the queen. One of the Sisters found the movie on TV this week and, with a squeal of joy, settled herself on the couch to watch. It took her almost twenty minutes to realize the movie was in Spanish. That linguistic fact did absolutely NOTHING to diminish the gloriousness of the viewing experience. The movie is that good. It’s like the female version of, “We read it for the articles.” Prepare for glory, indeed. 4. Olivia Wilde. The Sisters have developed a fascination with this actress. She is absurdly beautiful and a talented. She appears in a highly anticipated movie this weekend with James Bond and Indiana Jones. Additionally, she is also remarkably intelligent. Olivia comes from an American/Irish family of critical thinkers such as novelists and journalists. She married and divorced an Italian Prince. A prince! Her godfather is Christopher Hitchens. That little fact alone elevates her in our esteem. That gets us 1 degree closer to Mr. Hitchens in the 6 degrees of separation theory. Now if someone would just introduce us to Ms. Wilde. 5. Project Runway. We love this reality show of highly talented fashion designers. There are so many entertaining things about this show: We love Tim Gunn, when we grow up, we want to be Heidi Klum, and we are big fans of the Michael Kors look. In the season premier of the show on Thursday evening, the contestants were awakened at 5:30 am and drug “as they were” to the studio. The challenge was to make an outfit out of one bed sheet and the designer’s pajamas. This is the winning design – the orange checked section was the designer’s boxer shorts and the remainder was a dyed cotton bed sheet. Absolutely gorgeous.